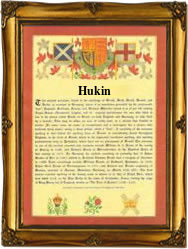 Recorded in over seventy forms including Hugh, Hew, Hauch, and diminutives Hewin, Hewkin, Hukin, Hugett, with patronymics Hewins, Hewkins, Huson, Hewson, Hughson, and many others, this is an Anglo-Scottish surname but one of Norman French, and ultimately Franco-German pre 5th century origins. The first spelling was as the given name "Hugo" meaning heart or mind, and as such this spelling appears in the famous English Domesday Book of the year 1086. Perhaps not surprisingly the personal name was highly popular, and by the 12th century was to be found in almost every European country. The surname is recorded in the same period, (see below), the first of all the such hereditary surname recordings being found in England. This was the country which first adopted both surnames and register recordings as we know them today. These early recordings include such examples as Richard Hue of the city of Worcester, in the year 1275, and John Hugh of the county of Sussex in 1296, whilst in Germany Willi Hugo is recorded as being a burger of Ravensburg in 3102. Later recordings include John Hukyns of Warwickshire in 1332, whilst Jacque Hugo was a French Huguenot refugee and a christening witness at The French Church, Threadneedle Street, in the city of London, on March 6th 1639. The first known recording of the family name is shown to be that of Rogerus Hugo. This was dated 1185, in the rolls of the Knight Templars of England during the reign of King Henry 11nd, 1154 - 1189. Throughout the centuries, surnames in every country have continued to "develop", often leading to astonishing variants of the original spelling.